Head down to the Central Library this week and stock up on children’s books to keep on your bookshelf – we’ve decided to keep our our mini booksale going after its popularity last weekend. 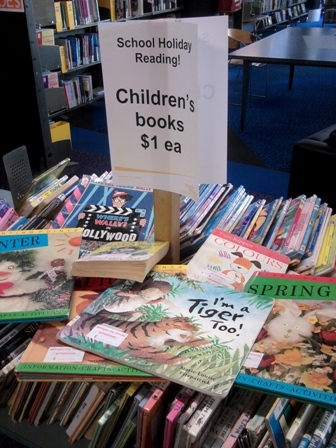 Our sales table includes picture books, fiction books and non-fiction Books for kids up to 12 years old and they’re only $1 each! It’s never too late to come and have a look – we’ll have new stock on sale regularly throughout the week. Why not come to the World Wide Weird holiday activity on Wednesday and check out the sales table afterwards?